At Affinity Workforce, we’re devoted to delivering a better way.A better way to build a workforce; A better way to build a career. Public services are creaking. We can all feel it. Growing demand and pressure, set against a backdrop of budget cuts, increased regulation and a severe skills shortage. It’s a challenging time for all. We believe that now is the time for genuine and dramatic change in how public services organisations build their workforces, and how staff develop and progress throughout their careers. So we’re pioneering new approaches to workforce attraction and engagement, delivering innovative new models and technologies to put public services back on the front foot. We’re devoted to delivering a better way. Whether it’s in education, healthcare or social care, we give clients the visibility, data and insight to make smarter, more informed decisions, and we provide access to the high-quality skills they need to hit their targets, whilst always remaining compliant. We recognise that our business is built on the strength and longevity of the relationships we forge with our clients and candidates. That’s why we’re dedicated to developing trusted, collaborative relationships that stand the test of time, based on mutual understanding, straight-talking expert advice, and a genuine desire to make a difference. We’re proud to work with the people on the front line of delivering public services and we’re committed to supporting them in any way we can. We’re there for our clients, 24/7. And what’s more, we’re putting ourselves at the forefront of raising standards within our industry, bringing the professionalism, transparency and honesty that everybody within public services needs and deserves. We’re here to offer a better way to recruit and manage your workforce, with better outcomes for all. We’re committed to providing public services workers with the very best opportunities, professional development and ongoing support, to help them forge ahead in their careers, from qualification to management. We support tens of thousands of teachers, nurses and social care workers, helping them to develop their careers and achieve everything they want to. And because we offer market-leading benefits and career-long support, it means that we’re able to give our clients access to the very best talent around – motivated, engaged, highly-trained people, ready to deliver great outcomes. Find out more about our unique offering for staff. At Affinity, we offer the best of both worlds. 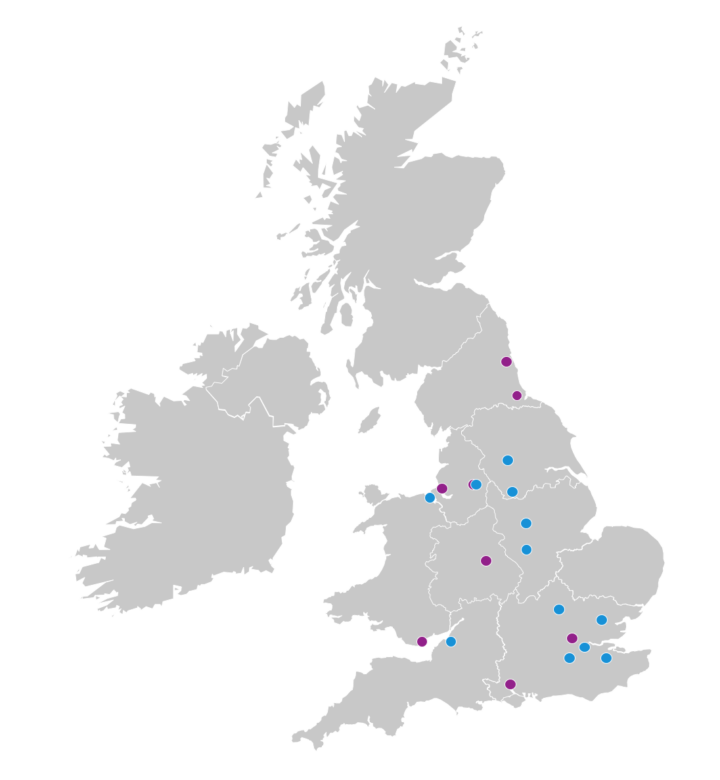 An extensive national footprint which provides scale, reach and expertise for your estate; combined with local and specialist consultants that have an unrivalled understanding of your area and the dynamics of your sector.